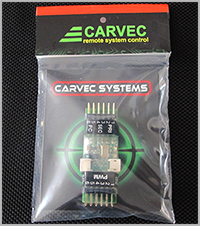 The CARVEC RC Signal-Master module will take inputs from virtually any receivers and allow them to be managed, sorted and merged into whatever is required. It allows automatic switching between inputs if the first choice goes into failsafe and also can apply functions to inputs such as slew smoothing for camera control. Visit our support forum for further information. Please visit our support forum http://carvec.proboards.com for more information / © copyright 2013 by CARVEC Systems ltd.